What is a yard ? Definition and examples. A yard is a unit of length in the customary system of measurement that is equal to 3 feet or 36 inches. One yard is slightly smaller than 1 meter. 1 yard = 0.9144 meter. Suppose a full-grown person stretches one of his arms as shown above. 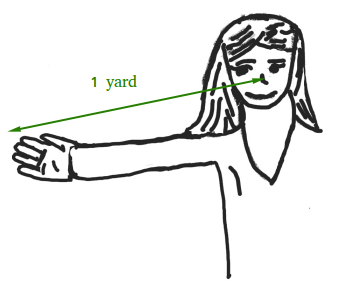 Then, the distance from his nose to the tip of his finger is approximately 1 yard or 36 inches. Other things that measure approximately 1 yard. Suppose your height is 5'10", then 1 yard is about the distance from your waist to the floor. The width of many refrigerators is about 1 yard. The height of a 3-year old child could be about 1 yard.